Home » Personal Finance » How to use BHIM Aadhaar Pay app? Most awaited BHIM Aadhaar Pay app is finally launched. It is an easiest and cheapest method of payment. Everyone can use this payment method. Be it rich or poor, a person with a phone or without phone. BHIM Aadhaar Pay is for everyone. This app allows a user to make payment using the fingerprint scanner. For authentication, it will use Aadhaar database. This app will be used by merchants to accept the payment. BHIM Aadhaar Pay app is another step towards a digital economy. 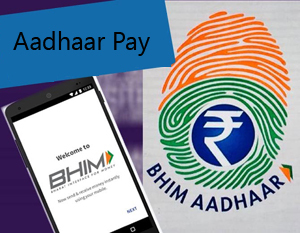 Let’s take a look at BHIM Addhaar Pay App in detail. What is BHIM Aadhaar Pay app? BHIM Aadhaar Pay is new payment app for android smartphones. This app is launched by the Narendra Modi government to increase usage of digital payments. A usage of this app eliminates fee currently being charged by private card companies such as Master card and Visa. In order to use this app merchant need to purchase fingerprint scanner. This app does not require any physical thing from the customer side. The customer should remember his/her Aadhaar number and keep its finger clean. Additionally, a customer should hold bank account linked with Aadhaar card. On the other hand, a merchant needs to make more arrangement to use this app and accept the payment. A step you need to follow to use this app is given below. Step-1 Merchant needs to download this app from Google play store. Step-2 Once the app is downloaded and installed merchant need to connect the phone to finger print scanner. Simple USB cable can be used for this purpose. Step-3 Merchant need to authenticate via proving finger print and 12 digit Aadhaar card number. Once merchant is authenticated he/she can accept the payment. Step-4 In order to make payment customer need to enter Aadhaar card number and amount. Once it is entered customer need to authenticate by pressing a finger on a biometric scanner. Step-5 On successful verification payment shall be done from your Aadhaar link account to merchant’s account. Benefits of using Aadhaar Payment app is given below. No requirement of a debit card or credit card by the customer. No need of a smartphone or any other wallet to make payment. No service charge or extra fees on making payment. No need to remember PIN or MPIN. No requirement of POS machine at merchant’s end. Additional referral bonus of Rs.10 and cashback for merchants. It is sure that Aadhaar Payment app is going to be most revolutionary payment app towards a digital economy. If you have any query about this payment method feel free to post in the comment section. What if multiple accounts are linked to aadhar card? Will it give option to select the account to which debit should be made? Yes if multiple accounts are linked with aadhaar card it will give option to select account while making payment.